Lab 10 is out and due Saturday April 20 before midnight. Welcome to CS21. This course will introduce fundamental ideas in computer science while also teaching you how to write computer programs. We will study algorithms for solving problems and implement solutions in the Python programming language. Python is an interpreted language that is known for its ease of use. We also introduce object-oriented programming and data structures. A deeper coverage of these topics will be presented in CS 35. This course is appropriate for all students who want to learn how to write computer programs and think like computer scientists. It is the usual first course for computer science majors and minors. Students with advanced placement credit or extensive programming experience should place out of this course and instead begin with CS31 or CS35. We will primarily be using the online book How to think like a computer scientist: Learning with Python by Elkner, Downey and Meyers. See the Schedule for each week's reading assignment. Given a program, be able to simulate on paper how a computer would execute the program, and show the results that would be produced. Given a problem, be able to design a clear, concise, and correct pseudocode algorithm to solve it. Given a pseudocode algorithm, be able to successfully implement it in Python. Be able to use top-down design to sub-divide a large problem into reasonably-sized modular sub-problems. Given several algorithms for solving the same problem, be able to analyze which algorithm would be more efficient in terms of running time. Develop debugging and unit testing skills. Consistently use these skills while implementing programs. Quizzes will be given at the beginning of class on the days posted on the Schedule. Please look over these dates carefully and contact the professor in advance if you cannot be in class for a quiz. If you are not present on the day of a quiz, and do not let us know ahead of time that you are missing class, you will receive a zero for that quiz. There will be one final exam for the semester. Details and dates will be released during the semester. Please read the section on accommodations if you are in need of extra time. You must inform us of accommodations or conflicts at least 2 weeks in advance of the exam. 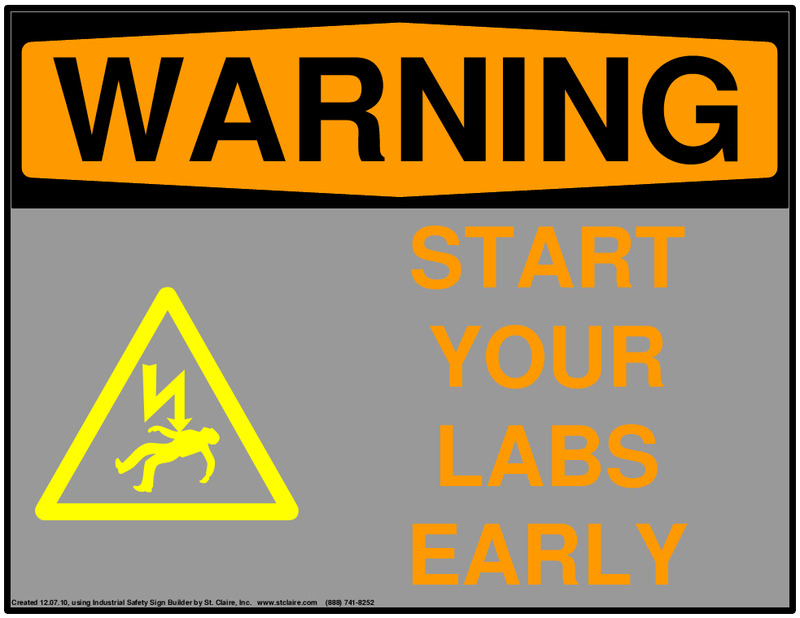 Lab assignments will typically be assigned in class at the beginning of the week and will be due before midnight on Saturdays. You are strongly encouraged to start early and to attend the study sessions for extra practice. You will submit you assignments electronically using the handin21 program. You may submit your assignment multiple times, and a history of previous submission will be saved. You are encouraged to submit your work regularly. Labs will typically be due Saturdays before midnight. Late submissions will not be accepted. Even if you do not fully complete a lab assignment you should submit what you have done to receive partial credit. The CS labs are open 24 hours a day, 7 days a week for you to use for CS21 lab assignments. If you feel that you need an extension on an assignment or that you are unable to attend class for two or more meetings due to a medical condition (e.g., extended illness, concussion, hospitalization) or other emergency, you must contact the dean's office and your instructors. Faculty will coordinate with the deans to determine and provide the appropriate accommodations. Note that for illnesses, the College's medical excuse policy, states that you must be seen and diagnosed by the Worth Health Center if you would like them to contact your class dean with corroborating medical information. Academic honesty is required in all your work. Under no circumstances may you hand in work done with (or by) someone else under your own name. Your code should never be shared with anyone; you may not examine or use code belonging to someone else, nor may you let anyone else look at or make a copy of your code. This includes, but is not limited to, obtaining solutions from students who previously took the course or code that can be found online. You may not share solutions after the due date of the assignment. Discussing ideas and approaches to problems with others on a general level is fine (in fact, we encourage you to discuss general strategies with each other), but you should never read anyone else's code or let anyone else read your code. All code you submit must be your own with the following permissible exceptions: code distributed in class, and code found in the course text book. In these cases, you should always include detailed comments that indicates on which parts of the assignment you received help, and what your sources were. Failure to abide by these rules constitutes academic dishonesty and will lead to a hearing of the College Judiciary Committee. According to the Faculty Handbook: "Because plagiarism is considered to be so serious a transgression, it is the opinion of the faculty that for the first offense, failure in the course and, as appropriate, suspension for a semester or deprivation of the degree in that year is suitable; for a second offense, the penalty should normally be expulsion." Be aware that we will be routinely running plagiarism detection software on the lab solutions of students from all sections of CS21. The spirit of this policy applies to all course work, including code, homework solutions (e.g., proofs, analysis, written reports), and exams. Please contact us if you have any questions about what is permissible in this course. Exam takers must place all non-essential items at the front of the room (or other designated area). Unless otherwise permitted, students may not have any electronic devices or course materials in their possession during the entirety of the exam. This includes cell phones, tablets, laptops, smart watches, course notes, articles and books, among others. These items should be placed at the front of the room near the proctor. If you need to leave the room during the exam, you must obtain permission from an instructor first. Any non-permitted discussion or aide in regards to exam material will result in immediate forfeiture of the exam and a report to the College Judiciary Committee. Please discuss any concerns or accommodations with your instructor prior to starting the exam. You can use your ID to gain access to the computer labs at nights and on the weekends. Just wave your ID over the microprox reader next to the lab doors. When the green light goes on, just push the door to get in (the door knob will not turn). If the green light doesn't go on, then we need to enter your microprox number into the system. Email local-staff@cs.swarthmore.edu if you have problems with this. If the building is locked, you can use your ID to enter the door between Martin and Cornell library. For this class, your ID will give you access to the labs in rooms 238, 240, and 256 and Clothier 16. If you believe you need accommodations for a disability or a chronic medical condition, please contact Student Disability Services (Parrish 113W, 123W) via e-mail at studentdisabilityservices at swarthmore.edu to arrange an appointment to discuss your needs. As appropriate, the office will issue students with documented disabilities or medical conditions a formal Accommodations Letter. Since accommodations require early planning and are not retroactive, please contact Student Disability Services as soon as possible. For details about the accommodations process, visit the Student Disability Services website. To receive an accommodation for a course activity, you must have an Accommodation Letter from the Office of Student Disability Services and you need to meet with us to work out the details of your accommodation at least two weeks prior to the activity. You are also welcome to contact us privately to discuss your academic needs. However, all disability-related accommodations must be arranged, in advance, through Student Disability Services. The primary introduction to course material is through class lecture. Additionally, we often do lab exercises during class. This is an important part of the learning process, as these exercises give you immediate experience with the material we are covering. Read the material before you come to class. Don't worry about total comprehension, but at least get a feel for what we will be covering that week. If you have some understanding of the material coming into class, it will be easier for you to ask questions during class, rather than later when help may not be available. This means both during class and while doing lab assignments. This class continually builds on previous material, so if you don't understand something one week, it will continue to be a problem the next week, and the week after that, and so on. If you need help, ask your classmates (make sure you have read the "Academic Integrity" section below first), attend study sessions, come talk with us during our office hours, post on piazza, or email us your question. Start the lab assignments early. We realize this one is not always easy to do, but if you can get in the habit of doing this, you will be much better off. If you get stuck early (i.e., not two hours before it is due), there will be time to look for help. In addition, if you start early enough, you can take a break, go do something else, and come back later. We find we always have at least a few new ideas when coming back to a problem after a break. If you wait until the last minute, you can't do this. The only effective way to learn the material and pass the quizzes and exams is to consistently do the labs. Finish all of the assigned programs (and do some extras, for fun!). Even if you don't get them done on time, they will still help you learn the material. Seek help early and often. Because course material builds on previous material, it is essential to your success in this class that you keep up with the course material. If you are having difficulty with a programming assignment, if you didn't follow something covered in lecture, if you feel you need some extra help understanding or practicing some of the course material, or if you just want to discuss something from a lecture, an assignment, or the text, please come to my office hours. Attend CS21 Labs and Study Sessions. Lab attendance is required. The student Ninjas hold evening study sessions each week. You are encouraged to participate in these sessions. The Ninjas will help you prepare for quizzes, will provide additional instruction in programming concepts, and will provide friendly assistance on your lab assignments. This semester we’ll be using Piazza, an online Q&A forum for class discussion, help with labs, clarifications, and announcements that pertain to all sections of cs21. You should have received an email invitation to join CS21 on Piazza. If you didn't, please let us know. Piazza should be used for ALL content and logistics questions outside of class, lab, office hours, and ninja sessions. Please do not email instructors or ninjas with your code or questions about the assignments. If there is a personal issue that relates only to you, please email your instructor. We encourage non-anonymous posts (which will count towards participation), but you may post anonymously. Do NOT post long blocks of code on Piazza - if you can distill the problem to 1-2 lines of code and an error message, that’s fine, but try to avoid giving out key components of your work. By the same token, when answering a question, try to give some guiding help but do not post code fixes or explicit solutions to the problem. Posting on Piazza counts toward your participation grade, both asking and answering! Links that are related to the course may be posted here. If you have suggestions for links, let us know.